This tasty dish is packed full of goodness & tastes amazing. Cover the Thai noodles in a boiling hot water, & leave in a bowl for 45 minutes. Cut the tofu or tempeh into cubes & cook in a hot pan with one tablespoon of coconut oil until nice & brown. Once cooked transfer to a dish & cover with tin foil. Use the same pan to cook the broccoli in coconut oil, transfer to the dish with the tofu. Prepare the sauce in a separate bowl by mixing all the ingredients together. The miso may take a while to dissolve but as long as you have combined it to a smooth consistency this will be okay. Pour the half the sauce into the pan on a medium to low heat & cook the onions & garlic for about 1 minute & then add the scallion, cilantro & toss together until the leaves have wilted. Then pour in half the sauce & allow to heat through. Then add the noodles & transfer the tofu & broccoli & heat through until cooked & serve immediately with fresh wedge of lime & chopped cashews or with extra cilantro if desired. This dish is packed full of complex carbohydrates & wonderful flavonoids from the vegetables & leaves. 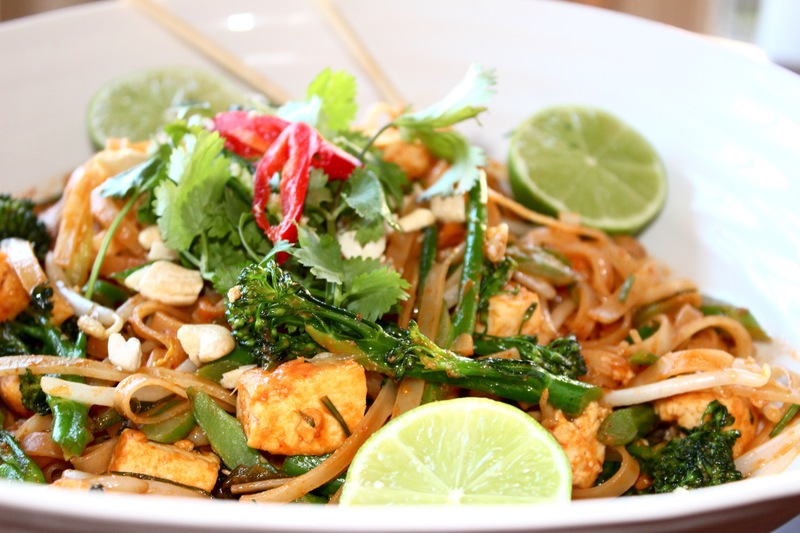 Rice noodles are made with rice, buckwheat & mung beans & are gluten free. They are packed full of fibre & protein. As well as providing zinc, iron, calcium & magnesium. Tofu is a great meat substitute as it is a good source of protein & contains amino acids. The benefits documented for regularly consuming tofu is that it significantly lowers total cholesterol & bad cholesterol (low-density lipoprotein levels). Some people don’t like tofu or soya products because of the effect on hormones & oestrogen. However I feel this is a personal choice & it can be used as a vegan meat substitute & it helps to satisfy your appetite & absorbs the flavours of the dish well. Broccoli is a great cruciferous vegetable & anti-inflammatory food containing fibre, protein, calcium, iron, vitamins A & C & potassium. Mung beans sprouts are crisp & are packed full of fibre as well as vitamins B, C & K.